Running marathons has been a lifelong dream of mine, and became an addiction for me after I ran my first marathon in San Francisco in 2006. Marathon day for is a celebration of all the accumulated training, sores, backaches, sacrificed early morning sleep-ins and Saturdays off, panic attacks, step after step, mile after mile, for months and months. Marathon day for me is like graduation day: everyone comes out and celebrates with you as you pass the exam, cross the finish line, but only us marathoners know what has really gone into this. 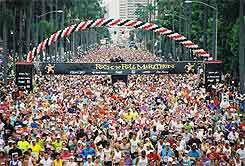 If you are starting out to do your first marathon, you are in for the experience of your life! The friends you will meet, the places you will go, the challenges you will overcome, the things you will learn about yourself. I envy you marathon virgin. There is nothing like running your first marathon. It is an incredible experience. I put marathon running right up there with giving birth, in a way you are giving birth to possibilities your never thought yourself capable of. You are re-awakening the idea in yourself that we were all born with but so quickly outgrow that you can do anything, thatthe possibilities are endless, that's it's not a question of if but when or how. If you have run marathons before, you're more than amazing for going out there and doing it again. Just as a mother when asked when she will have the next child just after giving birth, stares at you with an expression on her face like you must want to be murdered, but then after the countless dirty diapers, sleepless nights, nauseousness, cramps, when that baby looks at her smiling she remembers why she did it, and actually embraces the thought of having another. So you have forgotten the broken toenails, chafing skin, aching legs, arms, back, feet, head and the hobble from the finish line to somehow manage to arrive in many pieces at your front door wear you swore you would never be so crazy as to attempt something like this again and then you remember, crying with joy as you crossed the finish line no matter what your time was, the feeling like you were a rock star as you ran past crowds of cheering spectators, the wonderful things you learned about yourself and the human body. Yes, with time, you have forgotten the pain and embraced the joy, and now you look back euphorically, grab a bottle of Motrin and say, I think I'll do that again. Only this time, you want to be better, faster, stronger, hold your head higher, learn even more complex things about yourself. I could go on and on with the list of reasons why I return time and time again, and will continue to do so as long as I live, because it makes me feel alive, because it is something I do for myself, because running makes me feel crazy and yet completely sane, because I can eat pizza and beer and milkshakes without feeling guilty, because I am running for those who have lost or have not yet found their voice, their hope, their confidence, their strength, their selves, their essence, for cures to diseases and famine and dirty water and sickness and pain. But I would like to hear from you. What inspires you to get out of bed early in the morning, go out in the cold, the heat, the rain, push jogging strollers, make the trek after long days of working for crazy bosses and raising super-energetic children and run. Share your reason why, your inspiration. Here are some of my personal heroes. Who is your marathon hero? First timer, intermediate or pro, here are some tips for training for and running marathons. Enjoy running marathons as a way to see the world? Coming soon...are some tips for traveling and running (nationwide and international marathoning).